Across the nation community leaders are recognizing the important role farmers markets play in their localities. They stimulate local economies, increase access to fresh, healthy food, promote sustainable farming practices that protect our water and soil, and preserve American farmland. In response to requests from public officials, press and the market community, VAFMA is working to quantify some of these impacts. 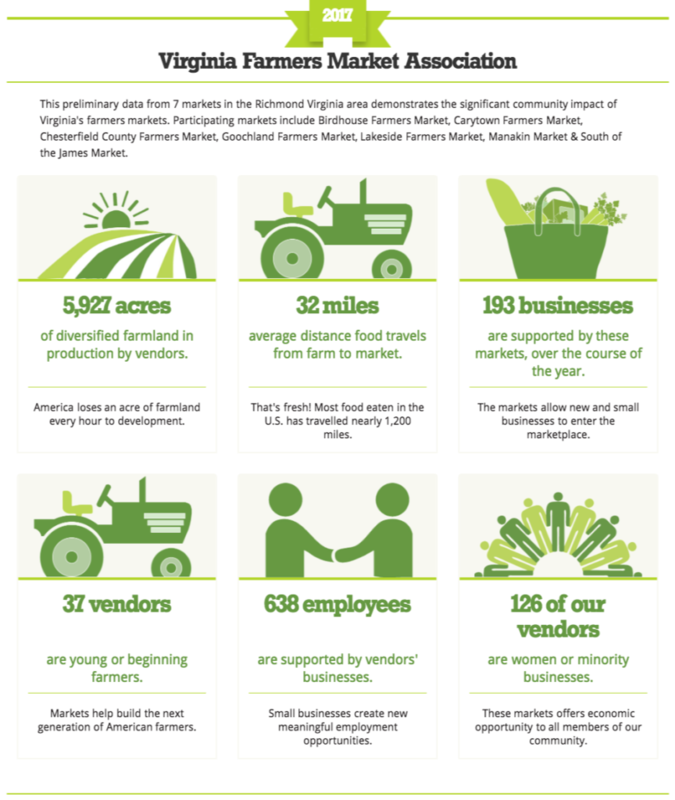 In 2017 VAFMA launched their Farmers Market Metrics program in collaboration with the Farmers Market Coalition (FMC). This program teaches farmers market managers how to collect, analyze and share data on the impact of their markets. In return, the participating markets share their aggregated data with VAFMA and FMC. The pilot group of 7 markets in the Capital region recently published their initial data for 2017 and the results are impressive. 5,927 acres of diversified farmland is in production by vendors. America loses an acre of farmland every hour to development. 32 miles is the average distance food travels from farm to market. Most food eaten in the U.S. has travelled nearly 1,200 miles. 193 businesses are supported by these 7 markets over the course of the year. Farmers markets allow new and small businesses to enter the marketplace. 638 employees are supported by the vendors’ businesses. Small businesses create new meaningful employment opportunities. 37 of the vendors are young or beginning farmers. Markets help build the next generation of American farmers. 126 of the vendors are women or minority businesses. Markets offer economic opportunities to all members of our community. We look forward to expanding the program statewide. The collection of this data is critical to showcasing the impact of sustainable agriculture on the Commonwealth of Virginia. Market Managers – Join our Metrics Program to learn how to collect, analyze and share data about your market! For occasional updates on our metrics project and related data on Virginia’s farmers markets, join our Virginia Farmers Market Data Updates email list.